CRIME, GUNS, AND VIDEOTAPE: Homeland Security Needs You!—To Snitch. Right: The official Gestapo Badge of the Thrird Reich. Washington, DC—For those that don’t understand how the Gestapo worked inside the Third Reich you can simply watch the Homeland Security propaganda campaign that’s underway in America. When the Nazis were in power in Germany, Heinrich Himmler ran the SS and the Gestapo or secret police. There were never enough Gestapo agents to investigate German resistance but that was never a problem. The Nazis made all the little busybodies of the land feel important by making them defacto Gestapo agents. People that had no life of their own were recruited to spy on their neighbors and send reports of their suspicious or subversive activities into the local Gestapo offices. Clerks would then take the reports and file them into dossiers on each citizen. 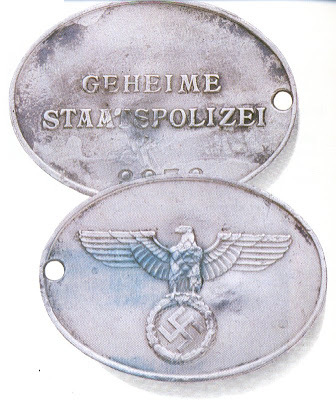 Serious allegations like spreading rumors against the Reich, making criticism of Nazi officials were immediately turned over to Gestapo agents who rounded up the accused. Once in the Peoples Court a death sentence could be handed down on the basis of written reports by snitches rather than sworn testimony. Sometimes people were held without trial for years or simply sent to concentration camps. Children were instructed at their schools to report their parents. Imagine you ground you child for simple juvenile misbehavior and your angry kid makes up a lie for revenge? The Gestapo knocks at your door, arrests you and makes you child a ward of the state. The allegation may be read in a court and the Nazi judge could send you to the guillotine or hangman’s scaffold. The lucky ones went to the concentration camps. Homeland security today is blanketing retailers everywhere with video messages and soon our schools will be assisting Homeland Security in deputizing your children to spy on you. They are collecting information about guns, ammunition and people showing distrust for the government. This is a great way to shut up critics. The government officials will be able stand back and say how popular they are since nobody is complaining. Janet Napolitano is the Heinrich Himmler of our time. What’s past is prologue. Plenty of red sashes nowdays.